As you may know, I was not always a yoga instructor. For most of my adult life, I worked in Customer Service, both as a call center representative and as part of the management team in the same environment. If there were to be some sort of competition for “world’s lousiest job,” I know there’d be lots of contenders*. However, I can say confidently that working in customer service has to be one of the most thankless, underpaid jobs that you can do. Essentially (at least in my case), it was a position that required me to attempt to bridge the gap, over and over, between an unhappy customer and the company’s policies. Eight hours of conflict per day. My colleagues and I did our best to smile, to be pleasant, to empathize and remember that the voice at the other end of the phone that was calling us names was just another suffering human being, but it was really, really hard. Ah, and let’s not forget about the sales and service goals that always dangled just beyond our reach. My yoga practice did help to alleviate the suffering I felt at this job. Through a consistent practice, I was better able to maintain compassion, to deal with the stress and unhappiness in more productive ways, and to eventually decrease the number of sick days I found myself having to take. Nonetheless, I felt incredibly free the day that I left to take on a yoga career. So, now that I teach yoga, and manage a yoga studio, is it, as someone suggested to me recently, like being on vacation all the time? Is everyone in the yoga community so enlightened, compassionate, and loving that conflict does not exist? Yoga, in the modern context, is very much a business. It has customers- who must be convinced that their hard-earned dollars should be spent on you, and not someone else; it has bills to be paid. It has competition in other studios, friendly or otherwise. It has parking issues, water bottle issues, and all kinds of silly things that you don’t even want to hear about. It takes a lot of love and it requires many long hours that don’t often pay much in return. And, inevitably, there’s conflict that will arise. Recently, I’ve had a few situations where I had to call on my customer service background to bridge the gap between customer (student) expectations and the needs of the studio. My first reaction to these situations was a kind of visceral, oozy “yuck.” Nobody likes saying “no” to a customer, or having to defend a policy or decision. And there is certainly an (albeit unspoken) expectation in the yoga community that we all DO get along, that we’re all super friendly and loving, getting together after class to share green smoothies and mat-cleaner recipes… or, at the other end of the spectrum, shopping together at Lululemon, or attending retreats in Bali, sipping fresh coconut water or whatever. I’m guessing about this part. Anyway. My “yuck” reaction was a lot like feeling attacked. I felt overwhelmed, defensive, cornered. Having to deal with an upset “customer” (or student, in this context) dragged me back, mentally, to my customer service days. The conflict didn’t feel good at all. Why was this unhappy situation part of my new happier life? Where’s the metta? Can’t we all just take Savasana? After the initial reaction wore off, I became interested in understanding why I felt this way, and how to synchronize my “yoga feelings” (compassion, love, etc.) with my “business feelings” (more practical financial and fairness concerns). As I mentioned earlier, I’d always felt I could handle these things pretty well in my previous life- but seeing the business conflict in this new setting, my strongly unpleasant reaction told me that I wasn’t as emotionally or spiritually mature as I’d wanted to believe. Interestingly, by bringing my awareness to both my reaction, and to the reactions of the parties involved, I’ve been able to feel a lot less yucky about these situations (I’ve used my meditation practice to help me. I can’t say it enough: practicing a daily sit is so beneficial to me). I’ve been able to break it down into a bit of a formula that I think might be helpful for future situations. Check Your Motives. I reviewed the situation to determine that I am acting out of the best possible motivation (as I currently understand it) for all parties involved. If I found that I was acting in a way that was not completely fair to the other party, either out of defensiveness, laziness or some other human motive, I adjusted my actions accordingly. Here we actively practice asteya- not stealing, as well as aparigraha- not hoarding. Look at Your Words. I did my best to examine my own behavior. Was I blaming someone else for the problems? (This always makes me feel slimy, although it’s a natural reaction for many of us). Was I portraying the situation honestly? Knowing that I was practicing satya, truthfulness, I didn’t have anything to hide when I spoke to the upset parties. Practice Active Compassion. In a recent situation where two parties were in conflict and I was at the pivot point, I could understand why they both felt the way they did. There was no question that both parties had valid emotional responses. Rather than attempt to argue or change mind, I empathized, apologized, and followed #2- spoke honestly about the situation and how it could be resolved. Active compassion is ahimsa in action. Let Go of The Results. After I’d done the inquiry in Steps 1 & 2, and done my best to experience active compassion in #3, there was simply nothing more to be done. The reaction of others, at that point, was in their hands. This is vairagya, non-attachment, in the yoga tradition. The Gita reminds us that we have a right to our actions, but not to the fruits of our actions. While it’s not always easy, there’s nothing left to do at #4 but let it go. These aren’t groundbreaking ideas I’m sharing with you. It’s not even anything I didn’t know a few years ago. So why is it WORKING now when it wasn’t before? I think the difference today is that I’m spending more time being honest with myself, which has created more space to listen and consider rather than reacting quickly. A daily meditation practice helps me to notice my emotions as they arise, and to be able to really “listen” when something that I am experiencing does not “feel right.” I know now that the discomfort I feel at these times is a sign that I have something to learn from the situation, and there’s often a better way to handle it. I also recognize today that #4- the “letting go”- is easier now because I am actively practicing steps #1-3. In previous customer service conflict issues, I was unable to let go of the situation because I didn’t feel good about how I’d handled it- or I wasn’t able to handle it in the way I wanted due to the restrictions of the company I worked for. This is a concern that is probably worthy of another post- how to live yoga when your employer won’t allow it. For today, I’ll just say that if you are practicing these 4 steps to the best of your ability at any given time, then you can feel good. 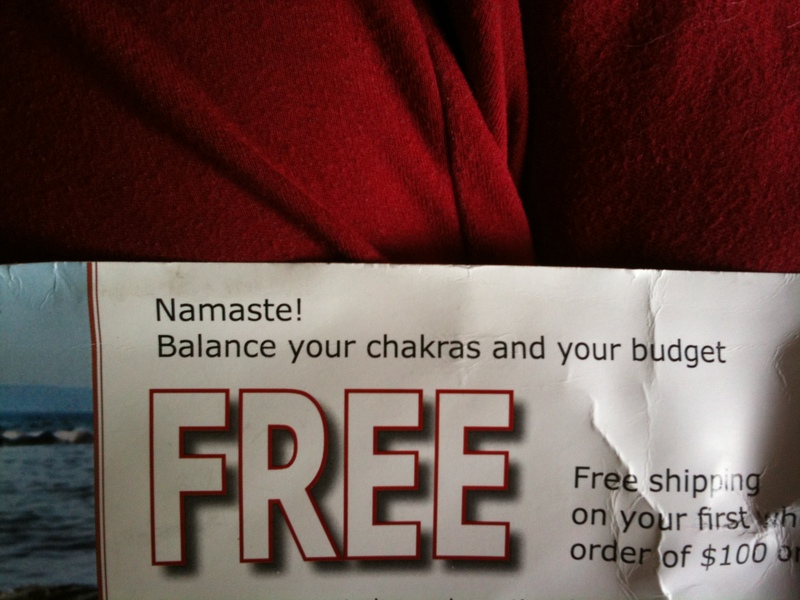 Yoga and business do seem to be at odds. Despite the challenges, It’s my pleasure to combine the two if it allows more people to experience the lightness and freedom- physical, emotional, mental- that come with the practice. Oh, and in the interest of fairness to another business- the image at the top of the screen is a picture I took of a postcard I received last week from Windrose Trading Company. I haven’t ordered anything from them, don’t know anything about them except that this postcard made me laugh out loud. This entry was posted in Business and Yoga and tagged business of yoga, yoga and business on February 22, 2013 by laurasana. What a wonderful sense of humor and hard work you have brought to managing Geo. Kudos to you, My Friend (and I proudly consider you my friend). No business is without its negativity, yet you do handle issues is a way that is to be admired. Keep on keeping on, and NEVER lose that wonderful sense of humor and true kindness that you so profoundly exude. Namaste.